This season's second hat is quite different from the first, but a fun knit nonetheless and an interesting shape and silhouette to spice up any handknit hat collection. 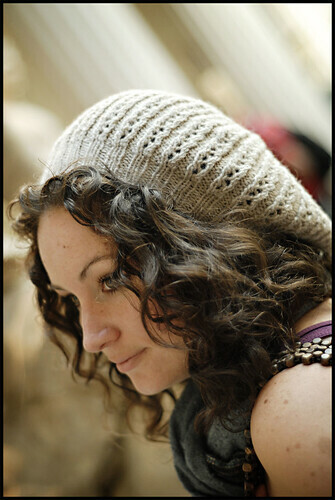 Porom is a shapely hat worked in Shetland wool. The simple, elegant lace repeat and healthy dose of slouch make it a great Fall accessory. 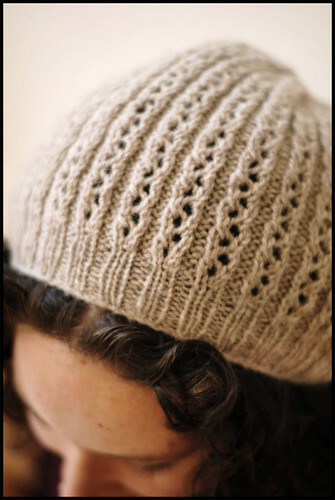 The hat is worked with approximately 190 yards of DK-weight shetland wool. This sample was knit with Jamieon's Double Knitting (the 3-ply version of the ever-popular Spindrift) and I highly recommend it as the ideal yarn match for this particular design. Shetland is light and warm and hard to beat where woolie lace is concerned. The simple lace rib repeat makes for an intuitive knit, while still yielding an elegant and subtle texture with a great, light-weight drape. 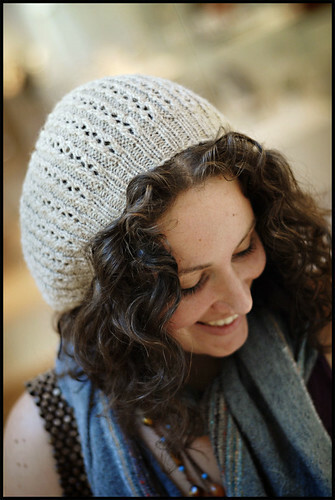 Shaping at brim and crown is integrated into the stitch pattern to avoid any unsightly visual hiccups. I'm really happy with how this project came out - the undyed wool and the stitch pattern made a texture I really like, despite it's simplicity. It reminds me of coral or a bleached sea-urchin's hollowed shell. The woolen-spun yarn traps air and is a super insulator, despite all those eyelets. A quick note about yarn choices - DK weight yarns come in a lot of shapes and sizes with a relatively wide weight-shift within their specific classification. Some DK weight yarns are slightly heavier and generally have a gauge of about 20 sts to 4 inches (Rowan Scottish Tweed DK is an example of this) - these slightly heavier DK weight wools are not recommended for this pattern. Gauge for this pattern is set at 22 sts to 4 inches and I highly recommend something on the lighter side of the DK spectrum for best results. Lightly spun yarns and animal fibers with great drape would look particularly nice. 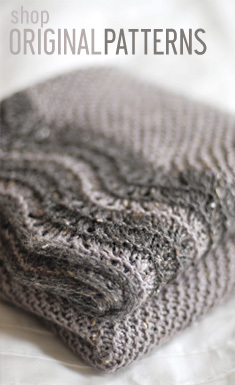 As a reference for stashbusters - Jamieson's Double Knitting is a woolen-spun 3-ply yarn. The pattern is available as a PDF download and priced at $4.75. You can obtain this pattern in one of two ways - if you are a Ravelry member, Porom is available in my Pattern Store as a Ravelry Download. The pattern is also available directly through PayPal for non-ravelry members or for those who prefer to go that route in general. A preview of the PDF layout can be seen below, with buttons to both methods of download following. Pattern instructions for lace motifs are charted. Congratulations on another great pattern! We need a book from you! Not only are you a phenomenal knitter, designer and photographer but all of your friends are so gosh darn good looking too. What's up with that??!! Have already added this to my Ravelry favorites. Beautiful! I'm knitting this at the moment - it's a great pattern with very clear instructions. Lovely hat and your model is so beautiful! I love it! I just made my first slouchy recently and finally found a style of hat I can wear. I'll definitely be making this at some point. Well done! 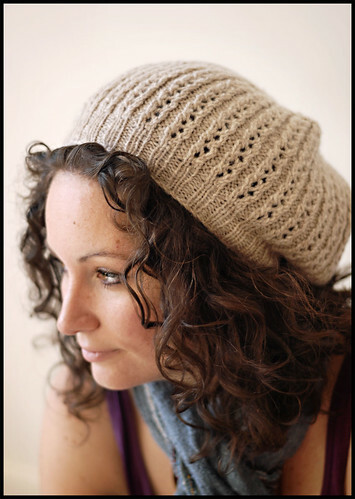 There is a current thread over at Ravelry in the "Curly Hair" group about how to wear hats with curly hair, so this pattern is seredipitously timely, especially with the gorgeous curly-haired model! I've posted it over there for all to admire (and hopefully, purchase). Thank you for another gorgeous pattern!! With your talent as a designer AND a photographer a book would be a great next step. A book photographed by a knitter, now wouldn't that lead to a nicer, more useable format, hmmm? Oh noes! I am feeling the call to action on this one. And oh, yes. Book? Wow - I just love how architectural all your hats are, and the way you incorporate the decreases into the pattern. It's a detail that is very appreciated by those who knit your patterns and by those who receive them as gifts. I'm still working (slowly) on my Red Light Special hat.....but this is perfect for a friend with curly hair for Christmas. Maybe I can find a DK weight cashmere?! So....is it hats for a while or are you working on other garments...just curious. I recently find your blog and i cant stop reading and watching all your work as a knitter and photografer, its a pleasure. Totally amazing! I have the pattern now and will start tomorrow night. Awesome!!! It's a pleasure to look at and a pleasure to knit - thanks to your very clear and accurate directions! I knit my first (there will be more!) version in a slightly heavier yarn (Rauma Istra)- albeit DK. I turned out fine - but I clearly see your point about rather using a lighter yarn. I ordered some of the Jamieson's DK and I'd also like to try it in the slightly lighter yarn Rauma Finull. It's so beautiful that I've been sitting her for several seconds, just saying, "Mmmmm, that's a beautiful hat. That's a really beautiful hat." Then a short pause and repeat. Mmmm, that's beautiful hat. That's a really beautiful hat. I love that you used a curly-haired model! I have curly hair myself and it is difficult to find hats that fit over the curls without squishing them. Thanks for the beautiful pattern! I agree....it is time that you write a BOOK, Jared! I've given you an award on my blog for the many ways you have inspired me. Thanks! Beautiful hat :) I really enjoy your blog and your designs :) Keep it coming! i ordered the suggested yarn but alas i didn't realize it was 2 x 25 gms and not 50 gms. and they really charge you on postage. but i love this hat and will order. The perfect beret pattern. I especially love how the eyelet pattern is pretty without being fussy. I will definitely download it. Another BT winner! I have no idea if this will even look good on me, but I HAVE TO HAVE IT! I've already downloaded the pattern, and I will begin spinning some suitable yarn from some natural dark BFL top I have in the stash, Post Haste. Thanks for another great pattern! I love it. It looks like cables that 'wanna be' lace. I'm so glad you put out such clever hat patterns. I've knit a ton of stuff but I have never heard so many compliments on my knitting skills until my 16 year old DD walked out the door sporting her Koolhaas in Lorna Lace's Shepherd Worsted in a almost-solid grape color. People thought I was a knitting genius. But credit goes to you - you're the knitting genius. I have never commented because you just get so many. I try to comment on lesser know blogs and started a group, Lesser Known Skeins on ravalry. to help less popular fiber artists share there work. As many tell you, I think you are an amazingly talented young man. Your mother must be very proud. I know I would be if you were my son. I hope a book is in the works. a lovely hat,I hope to make it soon. It's your cousin...clean out your damn email inbox!!! Do you have any ugly friends?? All of your pictures look like you have hired models! Another fantastic pattern, you are a machine! I've got the Druid mittens on the needles right now, just finished a Habitat, and bought the pattern & waiting on the yarn for this one. Continuously in awe of your abilities! What do you think about locating your pattern links on a separate web page and devoting your blog to your marvelous photos, insights, and musings? It would be lovely to find all of your pattern links in one place. thanks for the pattern. Definately on my wish list. I love your site! A great inspiration! Thanks! 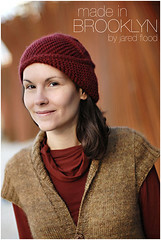 I love this hat and want to give it a try but am a novice knitter. I've done only very basic hats. Could you tell me if a beginnermediate could tackle this or would it be better for advanced knitters? I love your blog so much. I write a food blog, but I love, love to knit. I want to knit every scarf you've posted. I love the colors you pick. And your photography is so beautiful. ..
greetings from the flamingo ranch! your dad must be very proud of you.oh yes, as a matter of fact I AM! I've done 2 of these in alpaca, and could do one a week were it not for the eternal list. I love this hat SO much, and tried slightly different lengths. All worked. My favorite hat EVER! I did this in alpaca too, in a week! I'm giving it to my niece for Christmas! Very nice design! Reading the comments has given me more ideas for yarn choices.... off to ravelize. I just came across your blog on blogs of note. I noticed the neckwarmer and it reminded me of a new item from REI. I don't know what it is called, but it is like a neckwarmer, plus it comes up over the top of the head like a scarf/hood. It's super cute and I think a knitted one would be a great idea. Just a suggestion. I will definitely try to knit this hat.